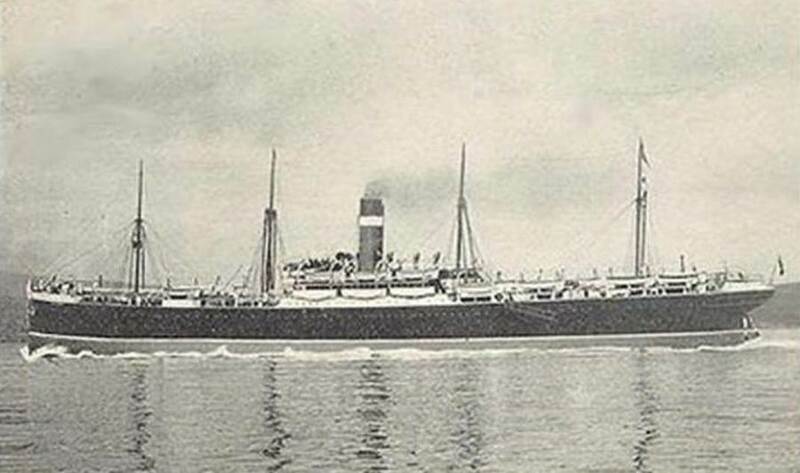 Wounded Merris (France), 3rd time - severe resulting in repatriation to Australia. Help us honour Phillip Davey's service by contributing information, stories, and images so that they can be preserved for future generations. 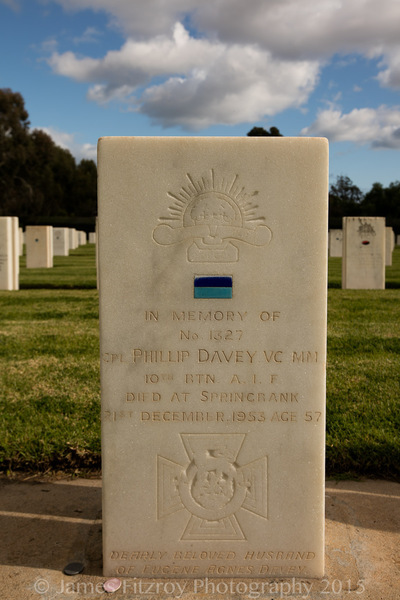 Phillip Davey (1896-1953), railwayman and soldier, was born on 10 October 1896 at Unley, South Australia, son of William George Davey, carpenter, and his wife Elizabeth, née O'Neill. Educated at Flinders Street Model School and Goodwood Public School, he worked as a horse-driver at the time of his enlistment in the Australian Imperial Force at Morphettville on 22 December 1914. 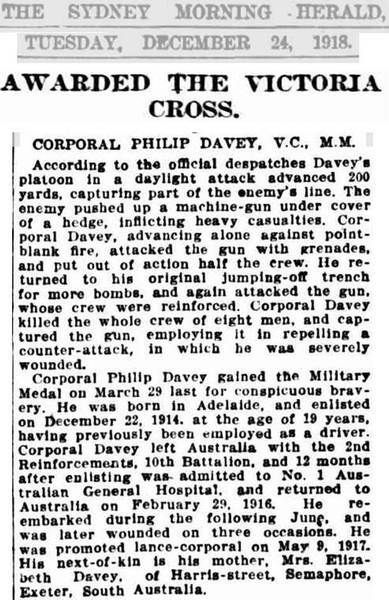 Davey embarked on 2 February 1915 at Melbourne with the 10th Battalion's 2nd reinforcements and proceeded to Egypt and Lemnos prior to the attack on Gallipoli on 25 April 1915. He was present at the landing and took part in four days of heavy fighting which followed. 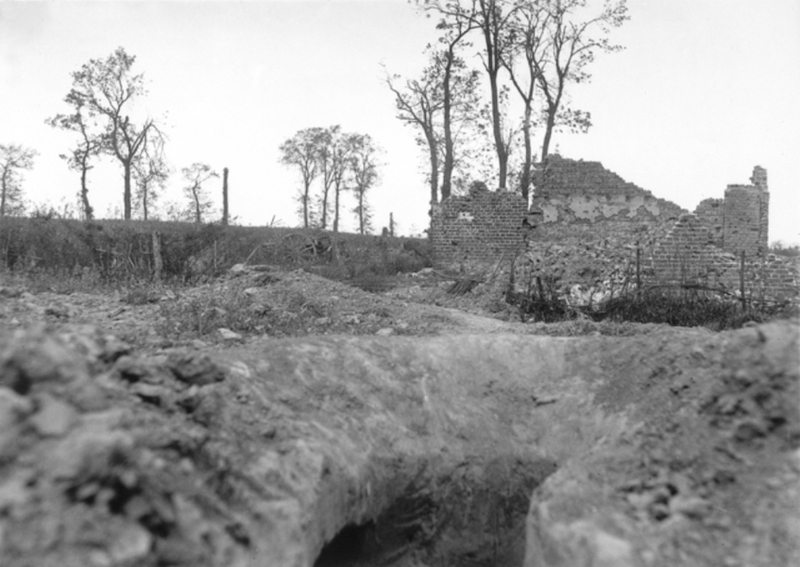 He was engaged in the subsequent trench fighting until eventually invalided from the peninsula with enteric fever. After treatment at the 1st Australian General Hospital at Heliopolis, Egypt, he returned to Australia in January 1916. 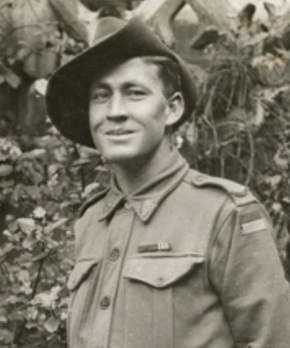 On 27 June Davey re-embarked with the 10th Battalion's 18th reinforcements and proceeded to England. He joined his battalion in France in September just before it moved into the line at Hill 60 in the Ypres sector. 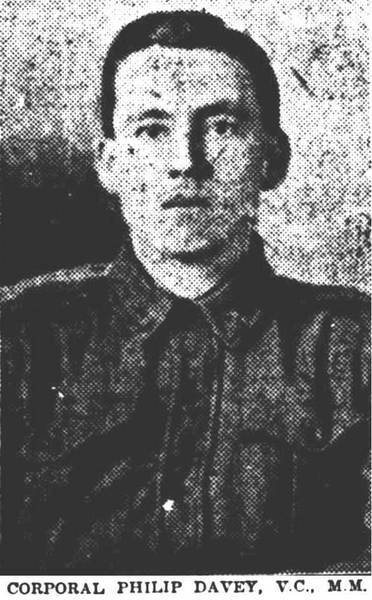 He was accidentally wounded on 15 March 1917 and was gassed on 3 October. The following information was sourced and submitted by Julianne T Ryan. 23/10/2014. Lest we forget. Father William George Davey, carpenter, and Mother Elizabeth (nee O'Neill) who lived at Dunn Street, Semaphore). 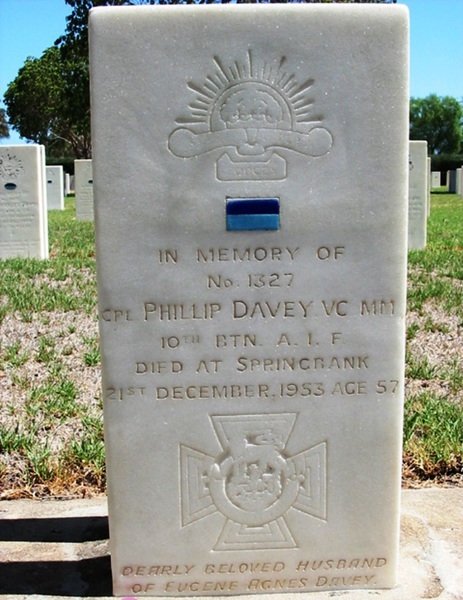 Prior to enlisting he lived at King Street, Exeter, South Australia. grey eyes; fair hair; Roman Catholic. 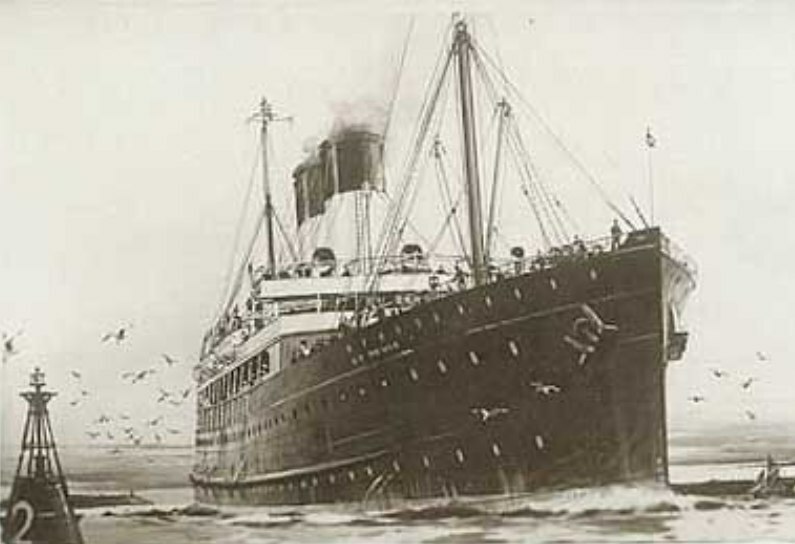 25/8/1916 Disembarked into Plymouth, England. Joined his unit in September. (for bravery near Warneton in January. 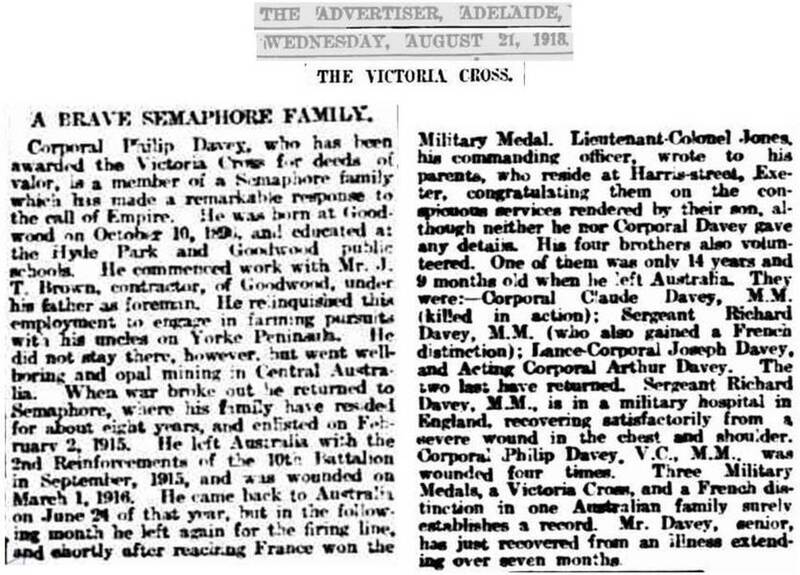 28/6/1918 In a daylight operation against the German enemy, recommended for Victoria Cross. Wounded (3rd time) in action as a result. 4/7/1918 Corporal Davey's wounds were severe and he was invalided to St Johns Hospital at Weymouth, England. 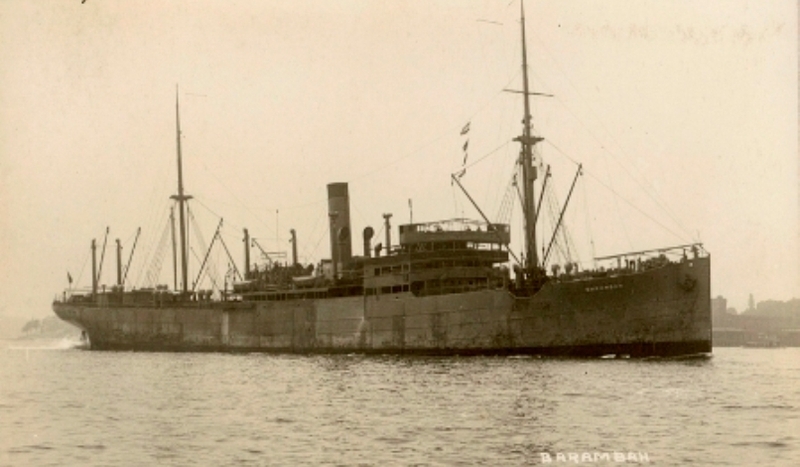 19/10/1918 He embarked for return to Australia onboard HMS Commonwealth. Davey was awarded the Victoria Cross for his bravery and determination in action; the Military Medal, service medals for the First World War, and coronation medals for King George VI and Queen Elizabeth II. WWI Star 1914-15 (3086); British War medal (2032); Victory medal (2005). 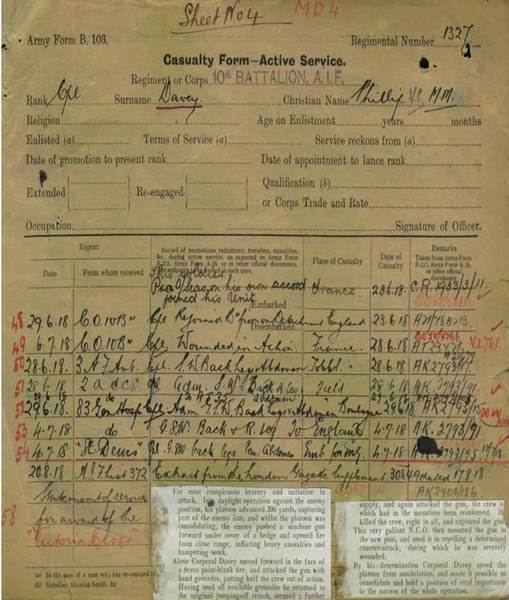 24/2/1919 He was discharged from the A.I.F. A.I.F. Garden of Memorial cemetery, West Terrace, Adelaide. Section: Kendrew Oval; Row Number: 7; Site Number: 58. Showing 4 of 25 images.